Last NY Fashion Week, you couldn’t move without spotting either a Gossip Girl or an Olsen twin on the front rows, but this season both have been uncharacteristically absent from the Bryant Park tents. This changed at Proenza Schouler, where both Mary Kate Olsen and Blair Waldorf herself, Leighton Meester, hit up the front row, alongside fashion week fave, Nicole Richie. Both debuting new styles, Leighton showed off a new ‘do, jumping on Hollywood’s hottest hair trend – the blunt fringe – in a lighter honey-tone shade to her signature chocolate brown. Wearing the same gold lamé top as Gwyneth Paltrow donned for the Two Lover’s premiere last week, luckily Ms Meester ditched the leather shorts, and instead teamed hers with an aqua snakeskin skirt. 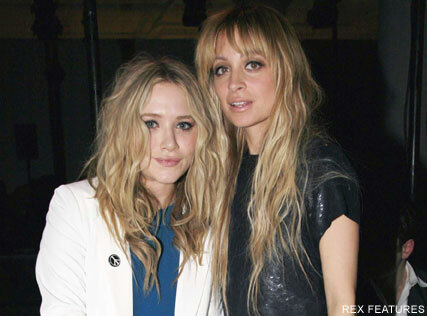 As for Mary Kate, and the fashionista debuted her latest endeavour – shoes! The actress revealed that she and sister Ashley would be adding footwear to their Elizabeth and James label, and showed off the first prototypes – a pair of black suede wedges. Cosying up to Nicole on the front row, the pair giggled their way through the show like long-lost friends. SEE MORE STARS ON THE FRONT ROW HERE!